D-Link's DGS-3324SRi is a 24-port Managed Layer 2 switch that is ideal for medium to heavy voice, video and data applications. D-Link’s xStack Switches Series is a set of “Next Generation” high performance stackable switches that deliver high scalability, wire-speed Gigabit performance, high availability, integrated 10-Gigabit stacking, redundant power options, and support for stacking in a “ring” or “star” topology. The xStack™ DGS-3324SRi operates as a high performance external switching fabric for the xStack™ DGS-3324SR, DXS-3350SR, and DXS-3326GSR. The “star” architecture of the DGS-3324SRi offers many of the same advantages as traditional chassis-based solutions such as greater switching capacity and shortest path switching. It features ASIC-based Layer 3 routing (RIPv1/v2, OSPF, and DVMRP), multi-layer traffic classification, and L2/L3/L4 Access Control Lists (ACL). The xStack™ DGS-3324SRi is a managed, stackable, multilayer, 24-port 10/100/1000BASE-T switch with (8) combo SFP ports. It has a switching capacity of up to 168Gbps and supports 6 integrated, rear 10-Gigabit stacking ports. It can be easily added to an existing stack of xStack Series switches to reduce network latency and improve switching performance, as compared to traditional “ring stacking” architectures. The hardware and software features of the DGS-3324SRi work together to allow customers to build cost-effective, high performance, high availability networks. Each DGS-3324SRi unit supports D-Link’s optional Redundant Power Option (the DPS-500), 802.3ad (Link Aggregation), and 802.1w (Rapid Spanning Tree), and 802.1s (Multiple Spanning Tree) for increased network reliability and availability. The DGS-3324SRi supports a variety of network management options including console CLI, Telnet, Web, SNMPv1/v2/v3, RMON, TFTP, Port Mirroring, BootP, and DHCP. It can also be easily managed using D-Link’s SIM (Single IP Management) Clustering technology for single IP management of up to 32 switches. It also provides a variety of advanced traffic management options including Bandwidth Control, Broadcast Rate Limiting, and support for IGMP v1/v2/v3. 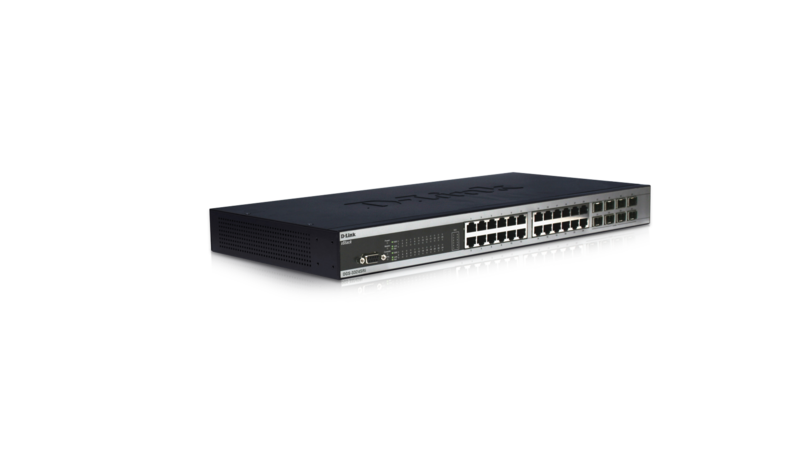 The xStack™ DGS-3324SRi implements a robust and consistent set of QoS/CoS, VLAN, and Security features. It provides 8 priority queues for 802.1p/TOS/DiffServ, with classification and marking based on MAC SA/DA, IP SA/ DA, TCP/UDP port numbers and IPv6 address and traffic class. Layer 3 dynamic routing protocols include RIPv1/v2, OSPFv2, PIM-DM, PIM-SM, DVMRP, and VRRP. Security features include 802.1x Port Based Authentication, 802.1x MAC Based Authentication; and Access Control Lists based on MAC address, IP address, TCP/UDP port numbers. It also provides extensive support for GARP/ GVRP, 802.1q VLAN, 802.1v IPv6 VLAN, and port based VLANs for a total of up to 4000 groups per device.